This complex combines Milk Thistle with four other beneficial herbs, to create a tablet that helps to cope with the excesses of the modern world. Assists in detoxifying the body. It protects and supports liver cells and encourages liver cell regeneration. Improves the production and movement of bile. Pack of 60 tablets - 1 - 2 month supply. 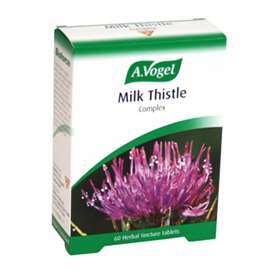 (One 250mg tablet contains the equivalent of 500mg A. Vogel Milk Thistle Complex Tincture). This liver is so important. It stores vitamins, minerals, produces bile (essential for the breakdown of fat), and is the main organ for the metabolism of food, drugs and hormones. If the liver's performance is impaired, it can cause gall bladder complaints and digestive discomfort e.g. nausea/indigestion after consuming fatty food. Other problems can be high cholesterol, weight gain and skin complains e.g. Acne or Eczema. Artichoke, Dandelion, Boldo and Peppermint: These all have a cholaogogic and choleretic action on the liver (Induces the production and flow of bile). Also, they help to remove toxins and help to restore liver function. Dandelion also a mild laxative and also has been traditionally used in gall bladder treatment. Peppermint and Boldo have an additional function in relaxing the smooth muscle, helping to relieve colic, dyspesia and can help with flatulence. Milk Thistle: Its main constituent is Simymarin. It directly effects the cell membranes of the liver, preventing further damage and encourages repair. Simymarin also helps to prevent excess cell production - as seen in psoriasis. To ensure a successful cleanse of your system, it is really important to cut out fatty, sugary and chemically enhanced foods and drink. This includes caffeine and alcohol and be sure to replace them with pleanty of water. Please seek medical advice if pregnant. If you are recovering from hepatitis, alcoholism, drugs or gall bladder disease, check with a health care professional first. Do not take if breast feeding. Ingredients: Fresh Cynara Scolymus* (Artichoke) leaves 46% • fresh Silybum Marianum (Milk Thistle) dried fruit 32% • fresh Taraxacum Officinalis* (Dandelion) herb and root 12% • Peumus Boldus (Boldo) dried leaf 7% • fresh Mentha Piperita* (Peppermin) leaves 3% • Also contains: Microcrystalline Cellulose & Cottonseed oil. *Organically grown.